I've completed a second small painting on parchment, very different from the first, Red Teeth, in composition, light and internal scale. 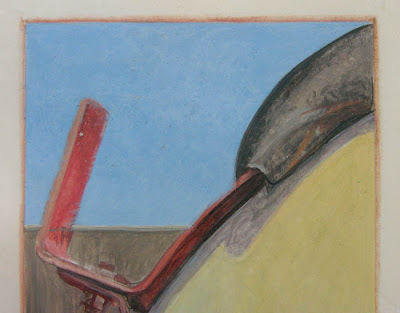 The image takes in more of the object, so doesn't appear as much of a closeup, but it is still a detail of a much larger study. Here the object is situated in more of a real space, since we read the blue shape as sky, existing behind the other shapes. 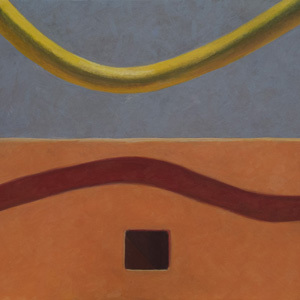 The yellow shape carries more light than the blue, and this heightens the illusion of space. 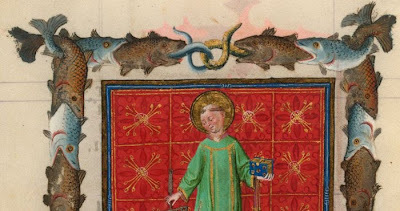 What you see above is the painting, 4 x 3.5 inches in size, the same size as Red Teeth, in an early stage, when I first put a layer of thin color on the parchment ground. This detail shows the blue, which I thought was done, but then noticed, when seeing it in a slanting light, that it had gotten covered with bits of dust and tiny hairs. (you'll be able to see this better if you click on the image to enlarge it.) Oh dear. I was having as much fun doing this painting as the one before, but I didn't have this problem before. When I tried picking out the dust, all the paint came along with it and left white spots. Oh dear. So I did what I thought was my only option, tried scraping off the paint, and it worked! using a palette knife, the paint scraped off quite easily from the parchment and I was able to start again with the blue layers of paint. Sorry to say I had to scrape a second time, but the third try at painting was a success. The calfskin parchment is a beautiful velvety feeling surface; because I'm a tiny bit uncomfortable with the idea of painting on an animal skin, I just went into the studio to look at my hand-made paper selection; maybe paper would work just as well. But no paper came close to the feel and look of parchment. I'm thinking of trying to stretch it over a wood panel, so the painting won't have to be framed; it might also solve the not-flat, a bit wavy, result of wetting the parchment during the painting process. I believe the paint, tempered with egg white, is tough, so won't have to be protected by glass. 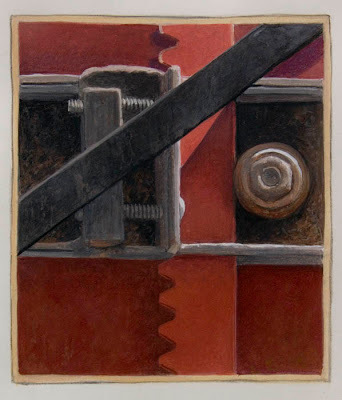 I am so enchanted by this process of working on a small size, where I feel intensely tied to the surface of the painting by precisely observed details. 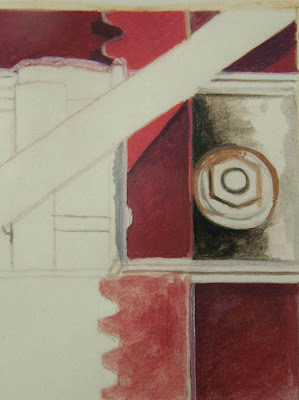 My focus and attention are heightened; my brushwork must be exact, but this is a thrill and not a chore. I feel as though I'm becoming addicted. And where else would I be able to paint with 24 ct gold, limning a border around the image? To give a sense of size, here's a photo that I shot of Yellow Arc leaning against the painting Black V: an amusing illusion ensues. It's been a while since I've posted a recipe, so here is a tasty dessert that uses some of those blueberries you have in the freezer from last summer's crop. 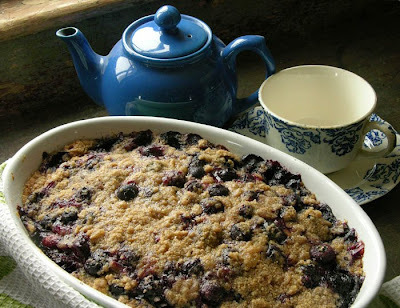 Last week I had a craving for an afternoon treat, a pick me up for the low ebb of the day, and remembered a recipe from a Ladies Auxiliary of the Lunenberg Hospital Society cookbook: Blueberry Buckle. I spent a summer over 30 years ago in Lunenberg, Nova Scotia, a very beautiful town surrounded by bays and inlets, a traditional center of shipbuilding. 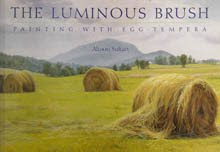 As in Maine, there was a large crop of wild blueberries, so there were recipes using them that were a bit quirky, for instance Blueberry Grunt, in which sweetened blueberries are covered with a biscuit-like dough and cooked in a saucepan over a flame. Blueberry Buckle is more traditional, a cake dough layered with blueberries and a crumb topping. Mix above ingredients and spread in a 8 x 8 inch pan. Bake in 350 degree preheated oven till golden brown, about 45 minutes. Here's a photograph of my worktable, showing two miniatures and Triangle and Curves, which is 14 x 22 inches, so you can get a sense of scale of the small paintings. I've begun a second miniature, very different from Red Teeth in internal scale, in subject, and in its light. I found it convenient to work on the small piece of parchment by taping it flat onto a watercolor pad, which is 9 x 12 inches. The parchment absorbs water and becomes wavy while I'm working on it, like paper would, so it's helpful to have it taped around the edges. You can also see my reading glasses, which are necessary for me now in close work. Gone are the days when I could do small, detailed work without glasses. 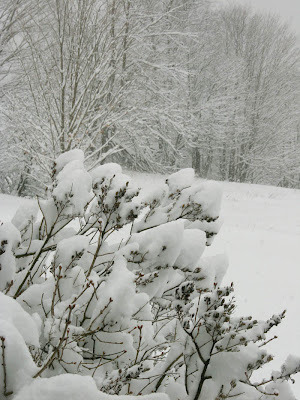 Just a few days ago, I wrote of a "Hint of Winter's End", but this morning I awoke to a very white world, with wet snow hanging on trees and shrubs, leaving only slight details of dark lines amid the pillowy paleness, a lovely sight. Not much snow had been predicted for this area, but when I went outdoors to shovel at noontime, I was surprised at its depth, a thick covering of 12 inches. 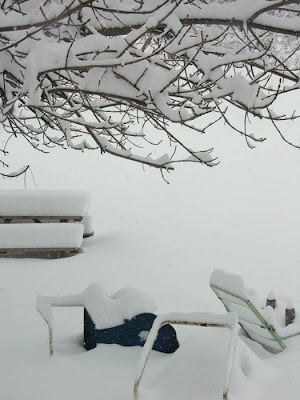 It then continued to snow the rest of the day, adding an inch or two more. In true New England fashion, the weather is always surprising. 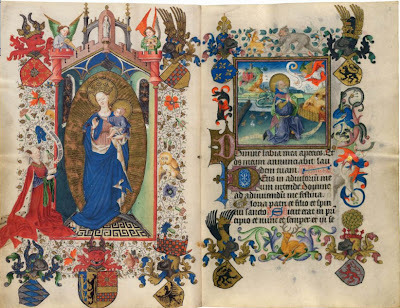 I was so thrilled and inspired by the exhibit of the Hours of Catherine of Cleves, which I wrote about here, that I really did dig out the two pieces of calligrapher's parchment, each 5 x 7 inches, stored away for years in my flat files. Then I went through my agricultural files, looking at photographs that never made it as paintings. Working with images that had some interesting abstract potential, I cropped them to make what I hoped were strong compositions. Here is the first of my forays into miniature painting, and my, did I have fun!! I first made a tracing of the photo (with some adjustments), which I'd printed full size, 4 x 3.5 inches, then transferred it to the parchment using a sheet of paper covered with chalk. That is the red color that you see above. I went over the lines with ink, then wiped off the chalk as much as was possible. 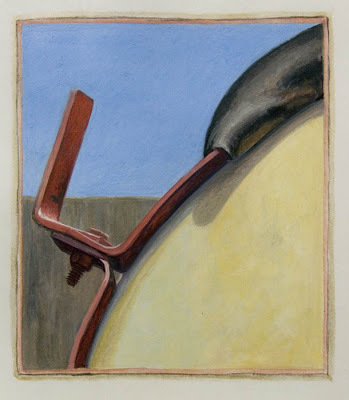 As with egg tempera using the yolk, I added about an equal amount of glaire to the pigment paste in my palette wells, and thinned a bit with water. 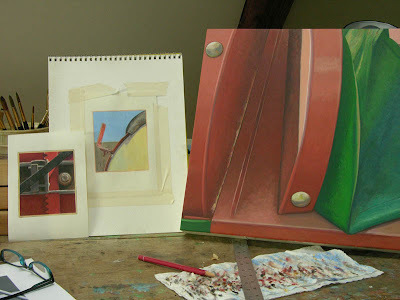 The image above shows the painting in its beginning stages, with some colors thinly washed in, and others with more layers of paint. I found myself using similar techniques to my panel work: layering color for greater depth, using a tint with white for opacity, thinly glazing some color for richness. The paint was very nice to handle, with a real ease in rendering detail––of course, considering medieval manuscript painting––and yielding a lovely subtle sheen. I had such a good time working on this painting; the parchment and paint are lovely materials; leaning in and focusing on something so small felt pleasurably intense; painting the small details was very satisfying. I decided to paint a thin border around the image, as is done in medieval manuscripts; it finishes off the painting and creates a frame, or window. What a treat to have a new medium to explore, a new art adventure. 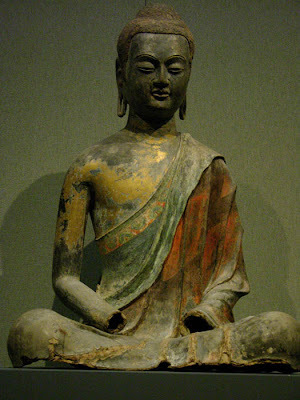 Seated Luohan, ca. 1000, Yixian, Hebei Province, China. Earthenware with 3 color glaze. Sometimes it happens that an artwork which I've found silent, and far from my understanding, will suddenly, marvelously, open itself to my previously closed heart. I remember this happening with the paintings of Henri Rousseau at the MOMA exhibit 25 years ago. One day I walked into a gallery at MOMA which contained several Jackson Pollock paintings, and they stunned me with their beauty, which had completely eluded me before then. 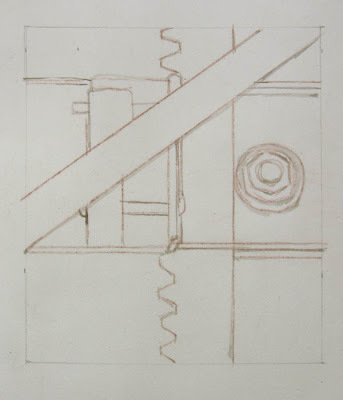 This same kind of electric bolt struck me when I visited the Metropolitan Museum back in December. 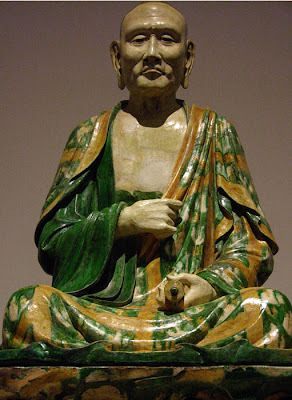 I'd been wandering through the Asian galleries, visiting some favorite ceramic pieces, such as this Tang dynasty Horse and Rider, when I walked into a gallery containing a selection of Buddhist sculpture, including two remarkable ceramic sculptures of seated Luohan, each larger than life size, and of compelling presence. Why had I not noticed these powerful works before? 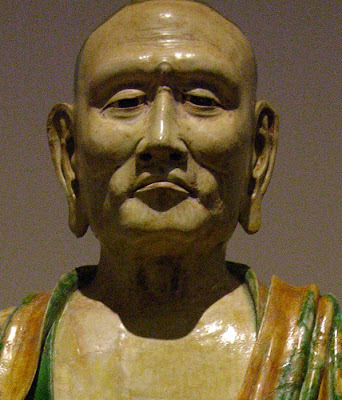 I don't know, but something in me has changed, so that I now see humanity, compassion, strength, and patience in these portraits of guardians awaiting the Future Buddha. I think that the portrait above is one of the most humane, and penetrating, that I've ever seen. He has an air of proud authority, but at the same time seems full of quiet understanding; his gaze penetrates, demanding a deep response. 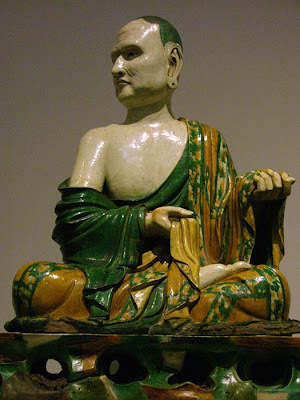 Another beautiful sculpture in the same gallery, of a seated Buddha, was made much earlier than the Luohan, using a complex process of dry lacquer. With its more idealized and simple form, rendered with subtle and refined modeling, it is full of grace and repose. It seems an embodiment of quiet, of introspection, and of peace. Today was one of those late winter days that point toward spring: the temperature was in the upper 30s, with a brisk wind that did not have the bitter edge of cold, but brought a smell of growth. As I walked on the snow, not needing snowshoes with the thinner layer, I felt its wetness underfoot. 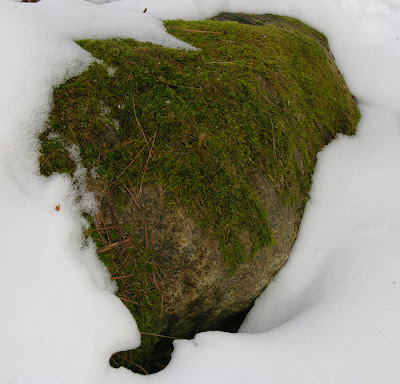 Snow is receding from boulders, revealing surfaces covered with mosses. 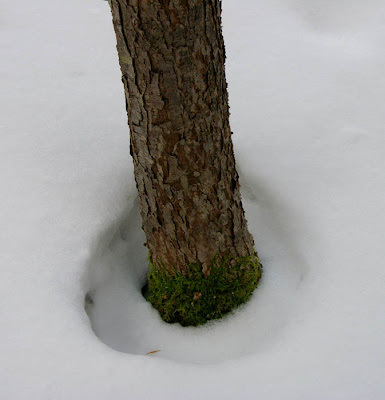 A sight I associate with maple sugaring season with its warm days and frosty nights is the circle of sunken snow surrounding tree trunks, their warmth pushing back the snow. Soon the ground will begin to show and form a brown skirt around each tree. 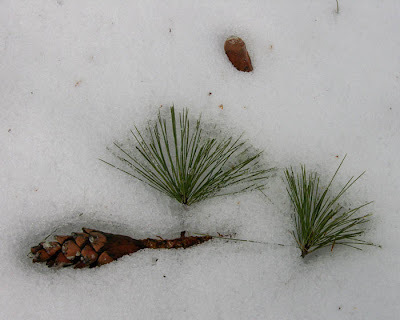 Small branches, seeds, pine needles, begin to sink into the snow, nestled into a perfectly shaped bed echoing each form. All these images of late winter, so heartening, will likely be hidden by coming snowstorms; winter is still far from over in northern Vermont. 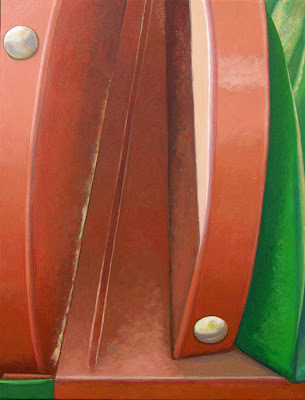 While working on this painting, I found myself uncertain about it; it felt like a very odd composition, with its combination of volume and flatness, red and green, and I wasn't at all sure that it would be somewhat successful in the end. 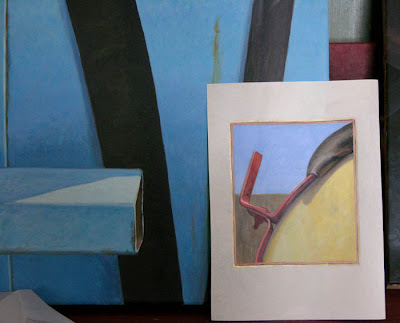 But I found that as it neared completion, the painting began to satisfy me, especially after a second repainting of the green triangle. 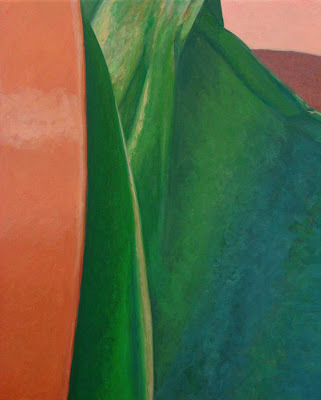 I was trying to have a textured surface on the green areas, next to the more smoothly painted reds. The jutting triangle seems to both lie on the red ground and float free of it. 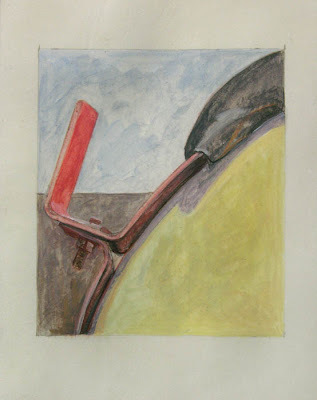 This work is full of metaphor, that I did not intend, as I was looking only at form, but I leave it to viewers to read into it what you prefer. 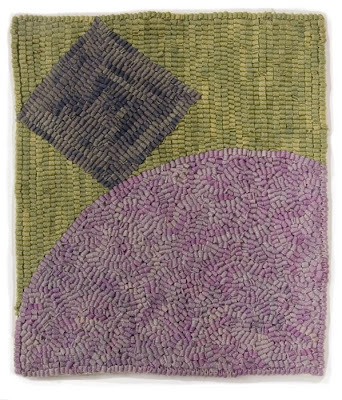 I enjoy the intimation of narrative, a rich layer added to those of color, form, and design. When I was in NYC in December, I took my camera to the Metropolitan Museum for the first time to photograph some of my favorite collections; see the posts on the Greek and Roman Study Collection, Chinese Porcelain, and Egyptian art. It was intensely pleasurable to form a deeper relationship with objects by photographing them; the close attention necessary to make a good photograph helped me to see each work more clearly; writing then aided in thinking about the art. Because of this I now carry my camera into the city and will try to gather images whenever I can. 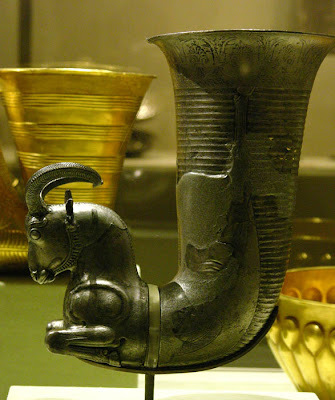 Sometimes I walk through the galleries of ancient Near Eastern art on entering the museum; I was very taken, last weekend, with the sculpted forms of animals, refined and sensitive, on ancient Iranian vessels. 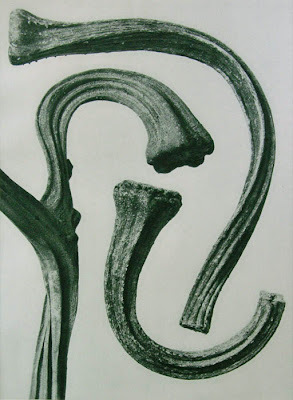 I believe I was especially open to seeing the beauty of these pieces because I'd just read The Cave Painters by Gregory Curtis, recommended by fellow blogger Julia Moore. The work of the prehistoric painters, especially in the earliest known, Chauvet cave, is sophisticated in its understanding of animal form and movement, and is very beautiful. It is stunning to think that the paintings were made over 30,000 years ago. The Iranian sculpture shows the same love and attention to each animal, described with subtle grace, that we see in cave paintings, or in ancient Egyptian art. 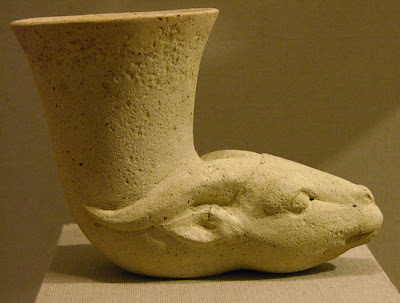 In the three vessels, the bodies of the animals are inventively integrated with the large cup shapes. I also wanted to show these works because, these days, we too often hear about bad news coming out of Iran; it is good to be reminded that Persian culture is a rich and ancient one. This vessel, which has a pouring hole at the front, is made of carefully worked precious silver. 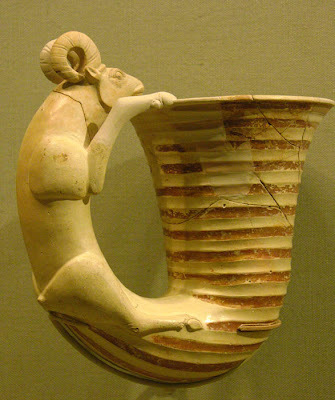 Although there are decorative elements on the ram––his horns, a bridle, a round shape on the shoulders––the feeling I come away with is of a wonderfully present, real creature, full of breath and life. 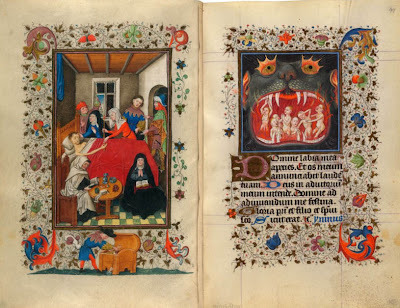 The highlight of my art viewing while in the city was an exhibition at the Morgan Library: the remarkable illuminations from the Hours of Catherine of Cleves. This book is an exquisite small––7 1/2 x 5 1/8 inch––manuscript, made around 1440 by the Master of Catherine of Cleves; it consists of a series of prayers, with 157 miniatures included in its pages. You can see every one of these images online at the link above; the Morgan has been very generous in publishing each page online, with crisp and clear enlargements. The manuscript, which had been divided into two books, has been taken apart for rebinding in proper order in one volume, so we have the unique opportunity to see all the pages before they are again within the covers of a book. 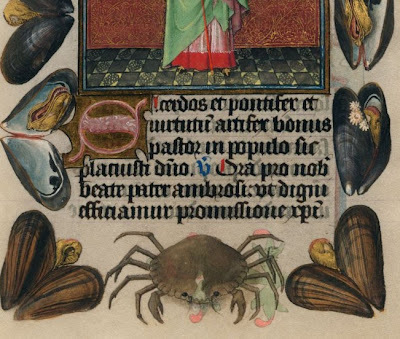 It is a pure delight to see the miniatures (take a magnifying glass, or reading glasses); surrounding the central images of saints or stories are marvelously imaginative borders. The small images seem to distill and heighten our viewing experience, as we are drawn into their worlds. 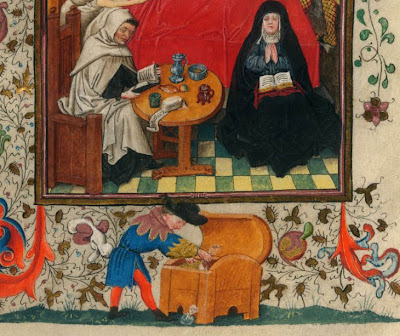 The dramatic pages above begin the manuscript; you can see Catherine in prayer on the left; the borders display, among other things, the coats of arms of her family. The depictions are refined and full of precise detail, while being fresh and lively at the same time. It is a magical combination. 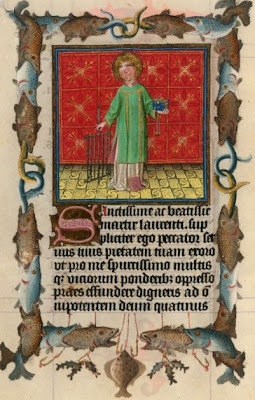 The miniature of Saint Lawrence shows him holding a gridiron, the method of his martyrdom, surrounded by fishes and eels; this border is one of my very favorites in its almost wacky surprise, its combination of reality and pure invention. It is speculated that the artist chose fish because they are cooked on a griddle. Are we meant to be amused? 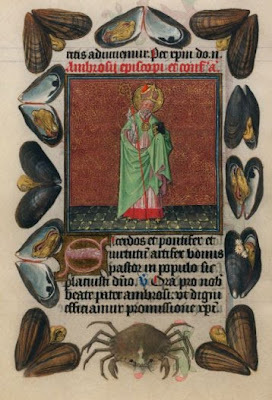 In another wonderful border, of mussel shells and a crab, the artist is pairing the saint with an illustration of his attributes: Saint Ambrose reconciled enemies; the crab and mussel are enemies, as crabs feed on mussels. The design of this page is striking, with another use of a subject we don't at all expect to see in a prayer book, or in any medieval art. The deathbed scene above is full of mundane touches, of a doctor examining bodily fluid and a table full of the necessities of the sickroom. Below, we see the dying man's evil son rifling through his treasure chest. Alongside death is Purgatory, in the maw of a frightening animal. I imagine that the elegant flowery border indicates looking forward to souls being purged of their sins. 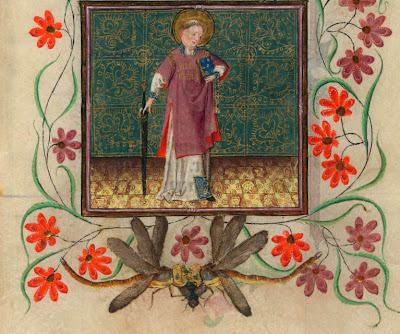 This last detail is of Saint Valentine, holding the sword of his martyrdom. He is surrounded by a lovely, graceful border of flowers and leaves, and at the bottom, the violence of nature, as two dragonflies attack a fly, another marvel of attentive descriptive imagery. 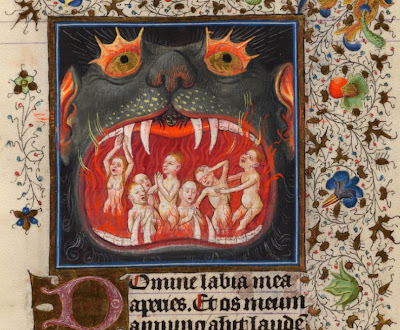 Illuminated manuscripts––European, Persian, and Indian––have long been some of my favorite art. A number of years ago, I even bought two pieces of parchment from a supplier, Talas in NYC, thinking I would try a small painting on it. Traditionally, pigment for manuscript painting is used with the white of an egg for binder, instead of the yolk as in egg tempera. As described in Daniel Thompson's The Materials and Techniques of Medieval Painting, the egg white is beaten till frothy and then allowed to stand, at which point it becomes fluid and can be thinned with water. After seeing this beautiful and inspiring show, I am again thinking of pulling out those pieces of parchment. 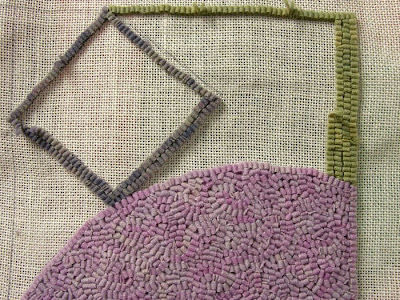 With this work, which will be 12 x 10 inches in size, I am back to the theme of balance, as in the ruglets Swing, and Lean. 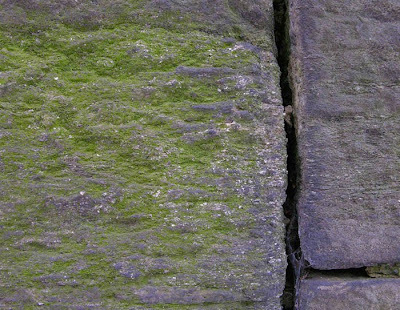 A square is tilted, touching the curve beneath and 2 outside edges, giving the appearance of being ready to tumble, yet held steady by its tight placement. 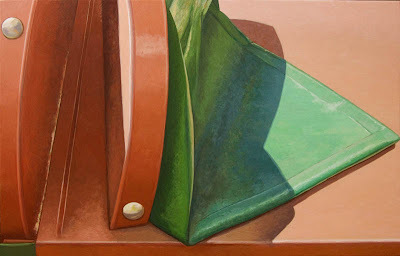 When I started doing color studies for this work, I used a green for the large curved form, but then switched it to the background because I didn't want the image to look too much like a big, grass covered hill. Last week, I pot dyed the three colors, crowded them so that the dye reached the fabric unevenly and yielded a mottled surface; I believe this adds a lot of life to the surface of the finished work. I used a color called Violet for the curved shape; it gave me a lovely pinkish color, which I varied by dropping some Yellow on it. 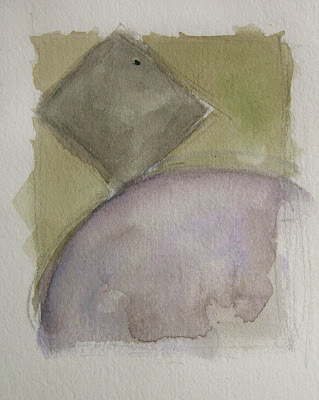 The square was dyed with Silver Gray, which looked quite purplish to me in the pot, so I added yellow here too, purple's complement, to dull the color. The green is Silver Gray Green. All the dyes I use are Cushing's Acid Dyes. 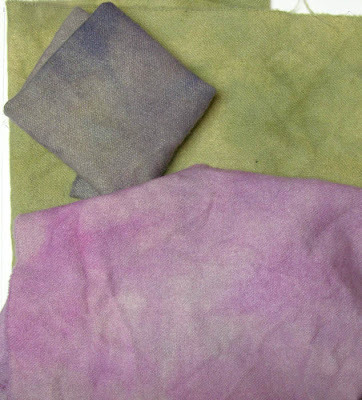 I like the color relationships that emerged from the dyepots: a slightly darker square balanced in front of a lighter green, next to a lighter but more intense violet. It will be interesting to see how these colors sort themselves out spacially once the ruglet is hooked. I decided to slip away from Vermont for a couple of days, and go down to New York City, where there was some real winter; I wanted to visit with family and friends, and see some art, which I'll share in the next few days. 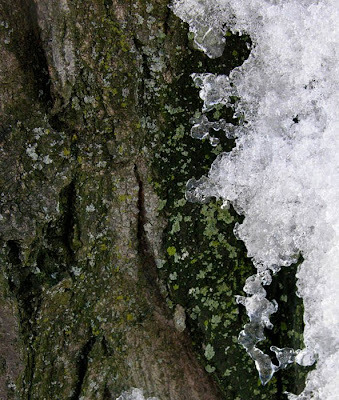 The remnants of the big east coast snow storm were mounds of dirty snow at the edges of sidewalks, and icy snow decorating the north side of tree trunks. 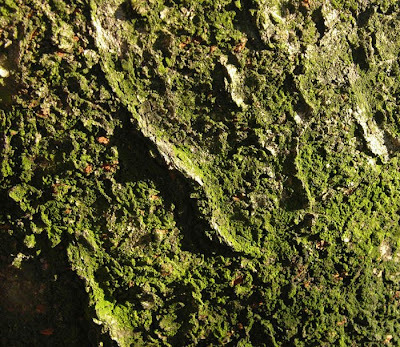 When I arrived in Brooklyn on Thursday afternoon, it was a lovely sunny day, so I went outdoors with my camera in search of my favorite small growing things: mosses and lichens. 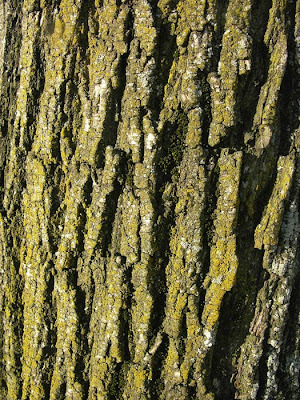 The lichens created soft green surfaces on bark very different from the bark in Vermont woods. The center image above was taken from a flowering tree in my parents front yard, a cherry I think; it looks like an aeriel view of a densely forested landscape, tropical, with hidden ruins of a great civilization. I can't identify the other trees, but their patterns are beautiful. 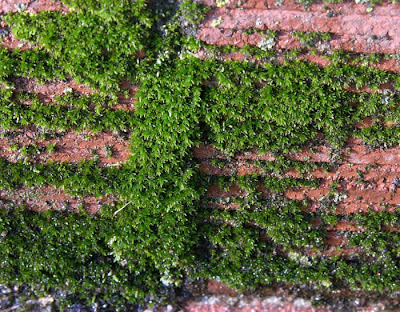 When I stepped outside, I noticed moss growing on the low bricks lining the front path. I was so happy to see it, because I learned from Gathering Moss by Robin Wall Kimmerer that many city mosses are sensitive to air pollution. These little plants looked very happy; the moisture from the snow had probably perked them up quite a bit. These large stones make up part of the massive wall running alongside Central Park, on Fifth Avenue north of the Metropolitan Museum of Art. 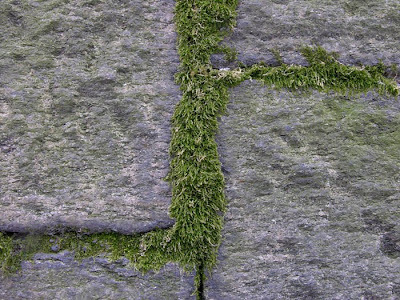 As I was walking south to the museum, I saw hardy-looking mosses––as they must be to survive the air of busy Fifth Avenue––in the spaces between the stones, and soft green lichens on their surfaces. 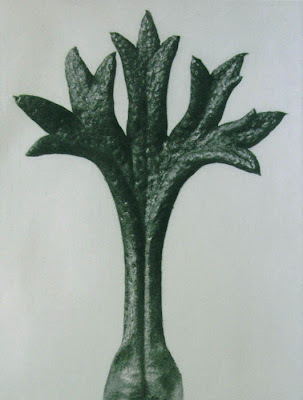 The greens decorated the solemn gray, a minimal palette on a geometric composition of line and rectangle. 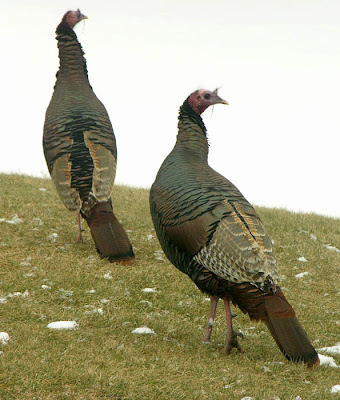 Here are the 4 tom (male) wild turkeys who made the tracks shown in a previous post. 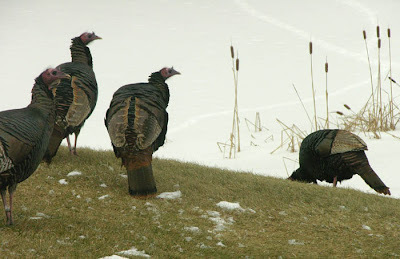 They seem to have made my front lawn, now sadly bare of snow, part of their daily ramble around the neighborhood. I first tried to take photos of them a few days ago, but as soon as they saw my shape at the window, they scooted off. Now they seem to be accustomed to me, so I was able to photograph them yesterday. They weren't even frightened off by Blinky the cat, who was outdoors; quite the contrary: Blinky slunk by them, seeming frightened by their large size. 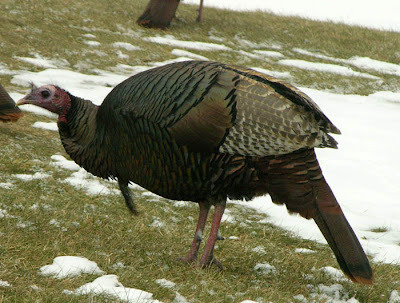 And they are grand birds, quite regal looking when upright, their feathers glowing with iridescent color. I once saw a male in full array––tail feathers spread, head bright blue, strutting for a mate––and it was quite a spectacle. These two stunning images, details of plant forms, are hanging above my desk and are vivid reminders of the power of clarity, simplicity, and intense observation; they are a wonderful antidote to the clutter of life and work around me. 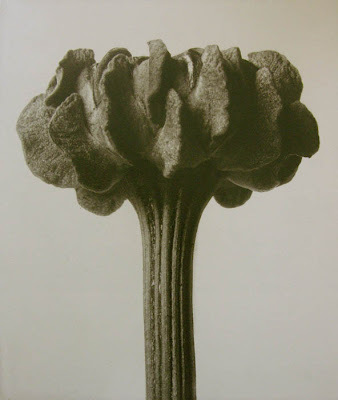 My framed works are photogravures from the book Art Forms in Nature (1928) by Karl Blossfeldt (1865 - 1932), a German professor of design in Berlin. The plain drama of these compositions––magnified plant parts, displayed on a plain ground, often symmetrical, seeming to be an abstraction from nature––appeal to our modern sensibility. 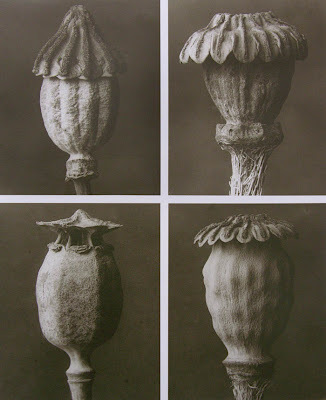 The photographs were not made as art, but as teaching tools for Blossfeldt's course on plant modeling; forms from nature were seen as excellent sources of design ideas. 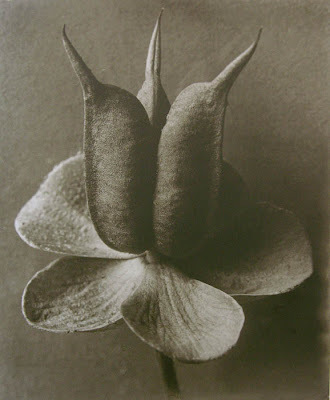 Because actual plant material was so fragile, Blossfeldt found that making photographs––using a macro lens and enlarging the detail many times––was just as effective as a teaching tool. When Art Forms in Nature was published, it received high praise from art critics and historians, establishing as art what the photographer had not considered as such. For us, I believe there's no question that whatever the initial motivation of their maker, these works provide a moving aesthetic experience. As we follow the changes of form, from large volumes to smaller, straight to curved, and notice the intricate details of surface, we enter a new world, once hidden: its tactile and visual pleasures enlarge us. 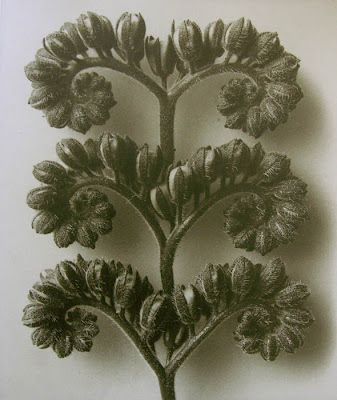 *The photographs below were taken from the book Karl Blossfeldt: Photography, which is no longer in print. The original photos were used for the illustrations and are all 30 x 24 cm, or approximately 11.8 x 9.4 inches. To see more of the images from Art Forms in Nature, use the link above.